Macrosiphoniella artemisiae apterae are of moderate size, greyish-green and wax powdered. The antennae and legs are mostly black, except for the base of antennal segment III and the basal part of the front femur which are brown. The siphunculi and cauda are entirely black (cf. Macrosiphoniella oblonga which has a green cauda). The body hairs are not placed on dark scleroites, and the sclerites in front of the siphunculi are very pale and hardly visible. The siphunculi are 0.6-0.9 times the length of the cauda (cf. Macrosiphoniella oblonga which has siphunculi 1.0-1.4 times longer than the cauda). 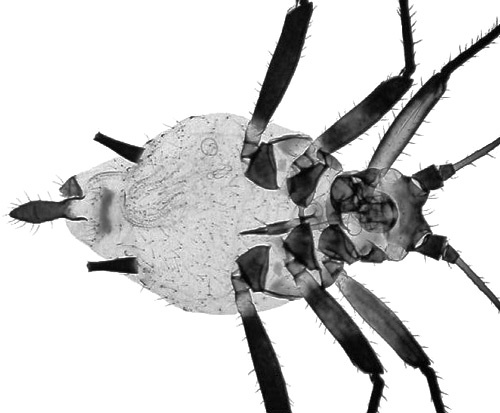 The body length of Macrosiphoniella artemisiae apterae is 2.3-3.6 mm. The Macrosiphoniella artemisiae alate is much like the aptera but the marginal sclerites are well developed. The clarified slide mounts below are of adult viviparous female Macrosiphoniella artemisiae : wingless, and winged. 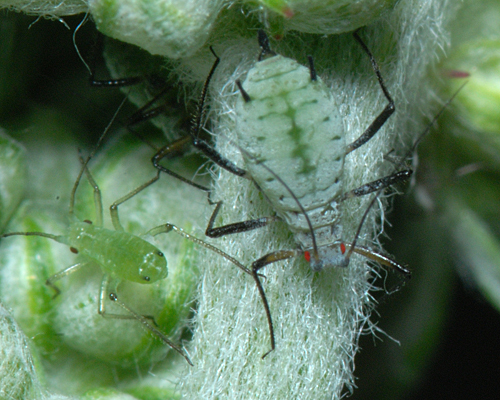 The mugwort aphid lives on the upper parts of mugwort (Artemisia vulgaris) especially amongst the flowers. Sexual forms occur in the autumn, and the species overwinters as eggs. Macrosiphoniella artemisiae is found in Europe, north Asia, North Africa and North America. Mugwort flowers in July to September in Europe, so populations of Macrosiphoniella artemisiae usually peak around this time. 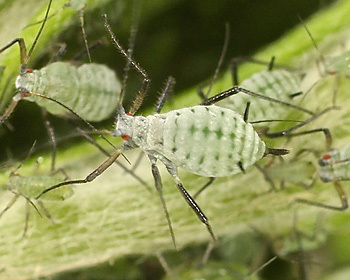 It is commonly found on the flower heads with other species of aphids in mixed species populations - such as below with a nymph of Macrosiphoniella oblonga. 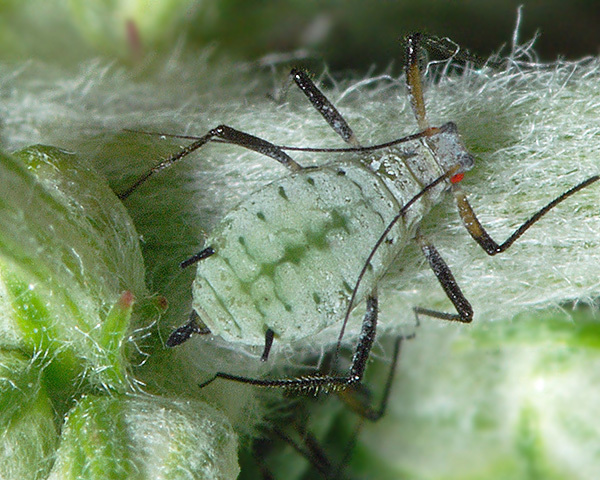 Like all aphids, the mugwort aphid exudes honeydew as an excretory product - a droplet can be seen below. 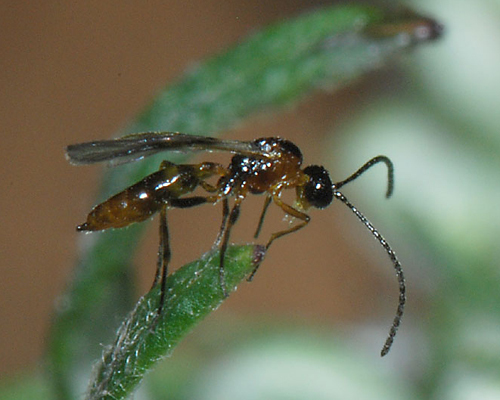 The honeydew produced by Macrosiphoniella aphids tends to have little or no melezitose - a sugar specially attractive to ants (Fischer & Shingleton (2001)) - so Macrosiphoniella artemisiae is not tended by ants. 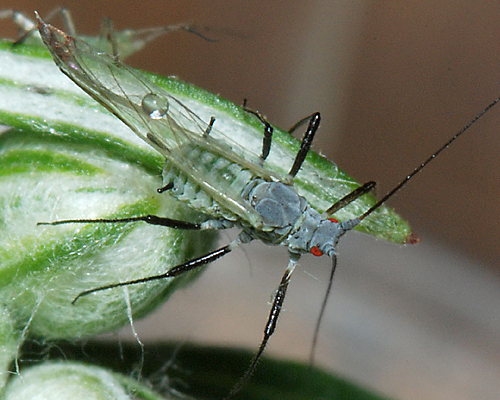 The mugwort aphid is often attacked by parasitoids. We are not certain of the identity of parasitoid that mummified the aphid below, but it is most likely to be Aphidius absinthii. Aslan et al. 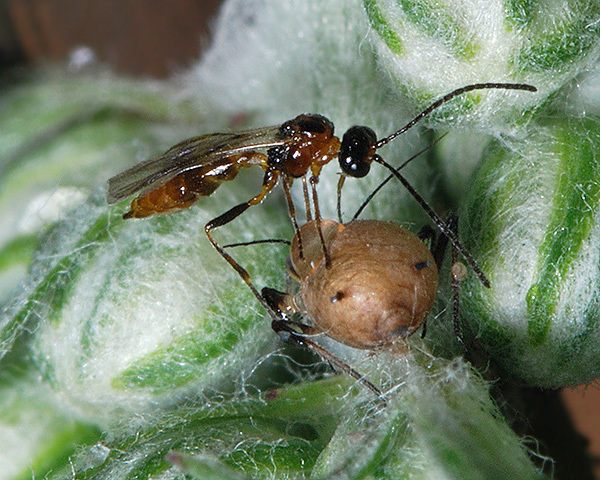 (2004) found the parasitoid Aphidius absinthii parasitizing Macrosiphoniella artemisiae in Turkey. Kavallieratos et al. (2004) recorded Aphidius absinthii, Binodoxys centaureae and Lysaphidus arvensis parasitizing Macrosiphoniella artemisiae in Serbia. 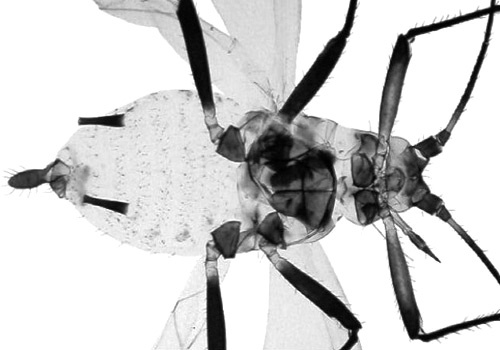 There is no information in the literature on whether Macrosiphoniella artemisiae has any specific defensive behaviour against parasitoids, although 'kicking' is the most likely. 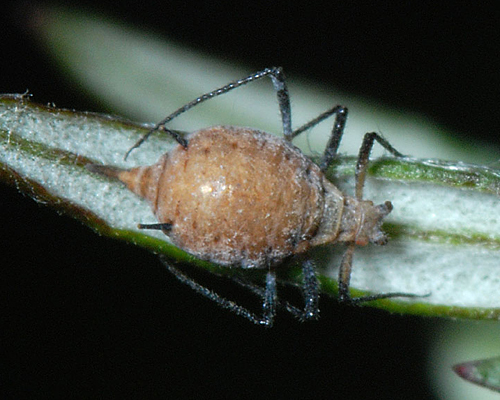 However, Ghish & Inbar (2006) have described defensive behaviour in response to vibration such as may be caused by a mammalian herbivore which may consume both vegetation and aphids - namely the aphids may drop from their host plant to the ground. Experimentally, vibration of the apical bud induced dropping in 36% of the colony members. Dropping rates were highest in mature aphids (63%). Relocation was remarkably efficient with nearly all mature aphids that were dropped 13 cm from the plant, finding their way back in about 40 seconds. Location was apparently based on visual cues. 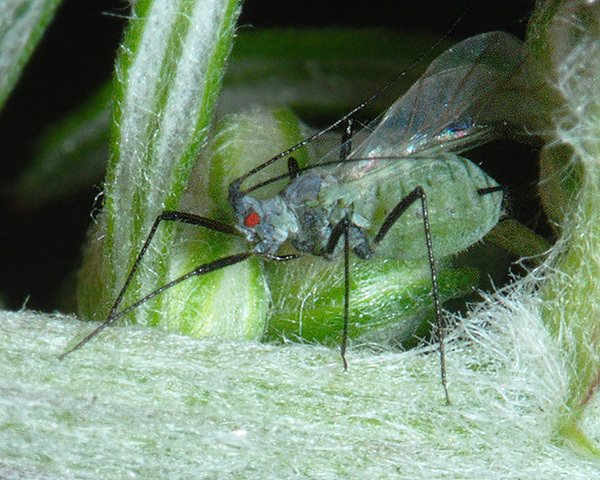 The authors concluded that Macrosiphoniella artemisiae is capable of visually discriminating between host and non-host targets and apparently does not react to volatiles emitted from the plant. Macrosiphoniella artemisiae has been recorded from 17 Artemisia species. Blackman & Eastop list 73 species of aphid (including 28 Macrosiphoniella species) as feeding on mugwort (Artemisia vulgaris) worldwide, and provide formal identification keys. Aslan, M. et al. (2004). A survey of aphid parasitoids in Kahramanmaras, Turkey (Hymenoptera: Braconidae, Aphidiinae; and Hymenoptera: Aphelinidae). Phytoparasitica 32(3), 255-263. Yesterday the Beds Invertebrate Group were at Stratton Moat, Biggleswade (a medieval ancient monument). This was heavily overgrown with nettles and goosegrass in particular but with a lot of Red Campion and old apple and plum trees. Sadly very few aphids and the apples were completely devoid of these and psyllids. A good list of species generally was assembled nonetheless. Prior to the meeting however on the road verge right beside where I had parked my car, I found another aphid species that I think is new for Beds. Macrosiphoniella artemisiae on Artemisia vulgaris. I surely have this one right so just a single record image attached here. Macrosiphoniella artemisiae - yes! A very photogenic aphid which can form enormous colonies. Many thanks Bob. Glad I at least got those right.